Quad 12L Classic review | What Hi-Fi? In the end it came down to two tracks: Arvo Part’s Litany and De La Soul’s Eye Know. When listening to these two somewhat contrasting tracks, both the brilliance of Quad’s 12L Classic loudspeakers, and also their shortcomings became readily apparent. The brilliance of the speakers is particularly easy to hear. Quad touts the 12L Classics as monitor speakers, and it’s easy to understand why. Their tonal balance is as even as you could wish for, and the integration between the 25mm soft-dome tweeter and Kevlar mid/bass driver is seamlessly handled. The 12L’s detail levels are high, and they deliver even the most complex of music in an impressively unflustered manner. The way they handle a natural recording such as Litany is truly a joy, particularly as they get the tonality and harmonic richness of instruments so right. The Quad’s stereo imaging is impressively precise and nicely layered –provided, of course, the recording has these qualities to start with. Much as there is to admire, however, we’re not totally bowled over. 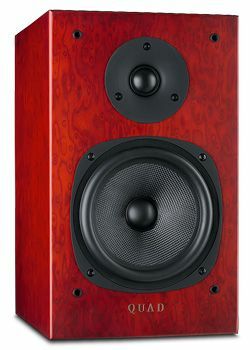 As with the Quad 11L Classic reviewed back in last year’s Awards issue, these standmounters aren’t the most exciting of listens. They lose a little too much of the exuberance of recordings such as Eye Know for our tastes. It’s a trait that can turn listening into more of an academic exercise than we care for. a wave guide – there’s still just something important missing sonically. And that’s the ability to convey a musical sense of fun, and dramatic verve and excitement. Until Quad manages that, the 12L Classics will remain a pair of speakers to admire – rather than to truly love.